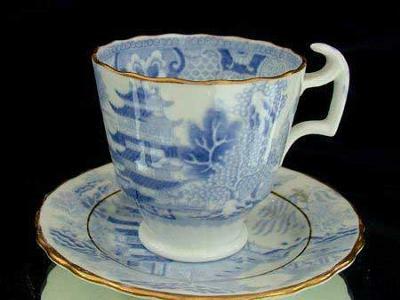 Pagoda Landscape Cup and Saucer – Is it the popular Willow Pattern? Hi, I am trying to identify the maker of this rather pretty cup and saucer. It has a feel of age about it and is nicely decorated with what I call a Pagoda Landscape pattern. A bit like a willow pattern. 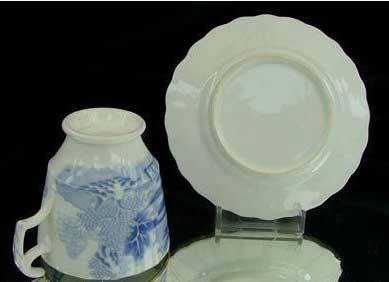 Uploaded photos provide side views of the Willow Pattern Cup and views of the saucer. It doesn’t feel oriental, more old English porcelain, but has no makers marks on either the cup or the saucer. It is quite small, the saucer is 11cm across and they feel like a really nice coffee cup and saucer. The porcelain is almost translucent as you can see the pattern when you hold the base up to the light. Would love to know more about it, possibly maker, age and if it is of any value. 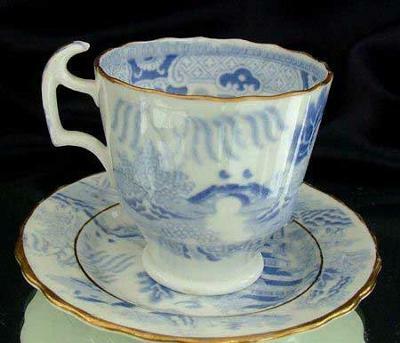 Hi Charles your cup and saucer looks to be early English porcelain decorated with the blue and white Willow Pattern. The Willow Pattern has been a stock-pattern of English Potters for over a century, and has become popular again in recent years. 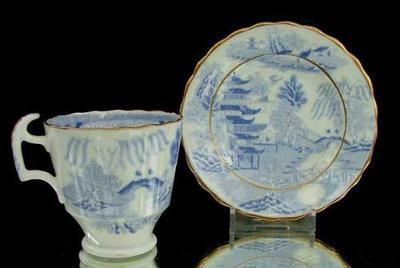 It’s almost impossible to tell the manufacturer from photos but both the cup and saucer look to be in very good condition, so should be of interest to both collectors of Blue & White and English porcelain. There was once a Mandarin who had a beautiful daughter, Koong-se. He employed a secretary, Chang who, while he was attending to his master’s accounts, fell in love with Koong-se, much to the anger of the Mandarin, who regarded the secretary as unworthy of his daughter. The secretary was banished and a fence constructed around the gardens of the Mandarin’s estate so that Chang could not see his daughter and Koong-se could only walk in the gardens and to the water’s edge. One day a shell fitted with sails containing a poem, and a bead which Koong-se had given to Chang, floated to the water’s edge. Koong-se knew that her lover was not far away. She was soon dismayed to learn that she had been betrothed to Ta-jin, a noble warrior Duke. She was full of despair when it was announced that her future husband, the noble Duke, was arriving, bearing a gift of jewels to celebrate his betrothal. However, after the banquet, borrowing the robes of a servant, Chang passed through the guests unseen and came to Koong-se’s room. They embraced and vowed to run away together. The Mandarin, the Duke, the guests, and all the servants had drunk so much wine that the couple almost got away without detection, but Koong-se’s father saw her at the last minute and gave chase across the bridge. The couple escaped and stayed with the maid that Koong-se’s father had dismissed for conspiring with the lovers. Koong-se had given the casket of jewels to Chang and the Mandarin, who was also a magistrate, swore that he would use the jewels as a pretext to execute Chang when he caught him. One night the Mandarin’s spies reported that a man was hiding in a house by the river and the Mandarin’s guards raided the house. But Chang had jumped into the rushing torrent and Koong-se thought that he had drowned. Some days later the guards returned to search the house again. While Koong-se’s maid talked to them, Chang came by boat to the window and took Koong-se away to safety. They eventually settled on a distant island, and over the years Chang became famous for his writings. This was to prove his undoing. The Mandarin heard about him and sent guards to destroy him. Chang was put to the sword and Koong-se set fire to the house while she was still inside. Thus they both perished and the gods, touched by their love, immortalised them as two doves, eternally flying together in the sky.